It's National Novel Writing Month! It’s November 1 . . . and that means National Novel Writing Month (NaNoWriMo) begins today! If it’s not something you’ve heard of before, let me take a moment to introduce you to this magnificent idea that has been launching new books for the last 18 years. Begun in 1998, NaNoWriMo is an initiative to encourage prospective writers to . . . well . . . WRITE! Each November, hundreds of thousands of people across the country and around the world commit themselves to take those novel ideas they’ve had brewing in their heads and actually get them on paper . . . or computer screens, as the case may be. AN ENTIRE NOVEL IN A MONTH? YES! 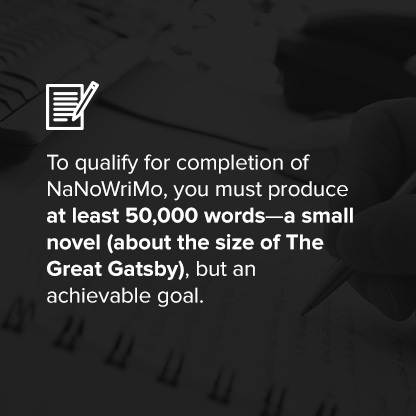 To qualify for completion of NaNoWriMo, you must produce at least 50,000 words—a small novel (about the size of The Great Gatsby), but an achievable goal. Will it be ready to send to a publisher? Probably not—it will still need honing and revising. But here’s the thing: In one month you’ll have a completed first draft. And that’s HUGE! CAN YOU DO IT? SURE! A half-million people are expected to participate in this year’s NaNoWriMo—and if they can do it, you can, too! What’s more: You’ll all be encouraging each other. Logon to NaNoWriMo’s website and create a free account. Then you’ll be able to get pep talks from published authors, use NaNoWriMo’s prep tools, engage in forums, find local write-ins, earn badges to mark your milestones . . . You’ll have the support of successful authors and the solidarity of fellow NaNoWriMo participants to help propel you to the finish line. BUT IT'S NOVEMBER and National Novel Writing Month has already begun—should you wait until next year? NO! Whether you start on November 1st or 2nd or 5th or 10th, or today, you can get started on your novel right now and have a first draft in 30 days—so why wait? Take advantage of the supports that the great folks at NaNoWriMo have put in place to get your novel written THIS year . . . THIS MONTH . . . RIGHT NOW! WHY DOES IT WORK? There are really three main ingredients to NaNoWriMo's success: (1) Solidarity, (2) Resources, and (3) Momentum. And we think there are some important lessons to be learned from these ingredients, whether you're writing in November or March or May! SOLIDARITY. Setting out to write a novel can be a lonely task—and a daunting one, especially if you’ve never done it before. “I’m going to write a novel” sounds like a pipe dream—something many people think about but most people never do. And it’s huge: A whole novel? Wow. But here’s where NaNoWriMo can help. If half-a-million people can do this, so can you! And it’s not just some abstract idea that there are 500,000 people writing novels this month; they’re really people with whom you can communicate in the forums. They’re facing the same writer’s block that you are; they’ve got the same questions about believable characters that you do; they wonder if their story is compelling, just like you do. As you work through those issues, you can share them with one another in the forums and the write-ins, and you not only benefit from each other’s ideas but you get concrete proof that it’s possible to do this! Writing a novel on your own can be lonely and daunting; writing a novel with half-a-million other people is much more fun, and IT PROVES IT CAN BE DONE! RESOURCES. The folks at NaNoWriMo have been doing this for a long time—18 years! So they’ve learned a thing or two about how to help people to be successful. They’ve assembled some great tools on their website, from podcast pep talks by successful authors, to write-ins (both virtual and real), to word sprints, to the Night of Writing Dangerously. They’ve got a bunch of great tools that are designed to get you over bumps in the road and propel you forward toward your goal, THE COMPLETION OF YOUR NOVEL! MOMENTUM. As we deal with our clients who are fiction writers, we find that one of the biggest pitfalls in novel writing is getting stuck trying to perfect one part of your book . . . and then never moving forward. You write a first chapter, and before you move on to the second you just want to hone and polish the first one to make it as good as it can be. And you hone and polish. And you hone and polish. And perhaps you get an idea for another book, so you put the first project on hold while you pursue the new one—for which you write a chapter and then want to beef it up before you move onto the second, so you hone and polish . . . You get the idea. One of the best things about NaNoWriMo is that there’s no TIME for any of that! You’ve only got 30 days. You know at the outset that you can’t get bogged down in editing, you have to just keep writing. 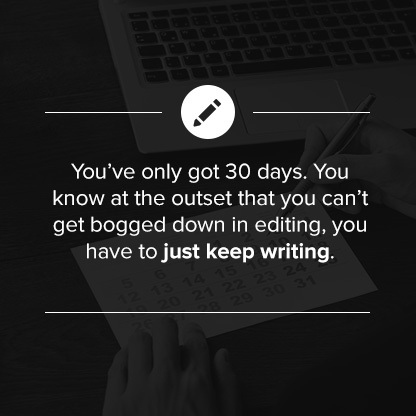 And you can’t switch book ideas, or you’ll never get it done in 30 days. So you just WRITE. The dialogue is a bit clunky—but you’ll worry about that later. JUST WRITE! One of your characters doesn’t quite work—but you’ll fix him next month. JUST WRITE! You have inconsistencies in your tenses or your point of view—but you can come back and fix that some other time. JUST WRITE! You have a great idea for another book—but you can’t think about that right now. You JUST WRITE! With a 30-day goal to get your novel on paper (or computer), you plow through the details that can often derail a project, and you just get your story and characters out where they belong. Then, when you’ve finished your novel—and celebrated appropriately!—you can go back and address those issues. But here’s the thing: When you go back to address the issues, they can no longer derail the whole project, because your story is already written. THAT’S THE GENIUS OF WRITING A WHOLE NOVEL IN A MONTH! AS AN ADDED ENCOURAGEMENT, a member of our Edits Made Easy team has decided to partner with you and share his experiences along the way. Lou Hyde is an administrator at Edits Made Easy, so he sees novel manuscripts going back and forth between our clients and our novel editors all the time, and he’s decided it’s time to write his own first novel. So Lou has signed up for NaNoWriMo and is beginning his novel TODAY! As he writes his book, as he explores NaNoWriMo resources, and as he connects with other writers, Lou will be tweeting about those experiences. He’d like to share the NaNoWriMo experience with you—and he invites you to share your own experiences as well. Just follow him on Twitter @EditsMadeEasy. Always wanted to write a novel but never knew how to get started? Well, HERE'S YOUR CHANCE! Follow Lou on Twitter. Sign up at NaNoWriMo.org. Join a half-million people who are all writing novels this month. And bring that novel idea to life! BONUS-BONUS-BONUS! At Edits Made Easy, we love to find ways to help encourage new novelists! If you participate in NaNoWriMo, we’ll give you a 10% DISCOUNT off your editing, coaching, or pre-publication package. Just mention NaNoWriMo when you send us your manuscript, and the discount is yours—all because you accepted the challenge of National Novel Writing Month!